A new TILDA report entitled Patterns and Determinants of Health Care Utilisation in Ireland was launched at the TILDA annual conference on 13th March 2013. 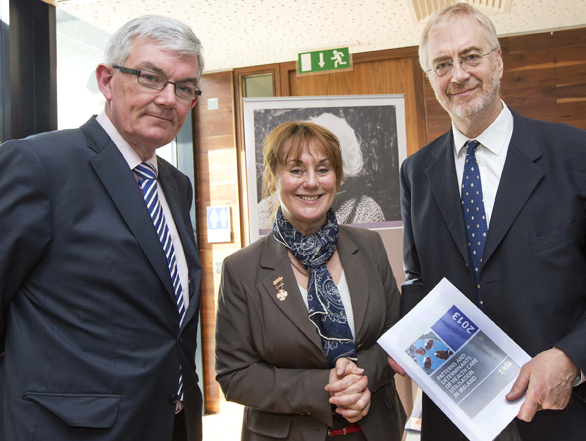 Pictured above at the launch of the report (left to right) are Dr. Ambrose McLoughlin, Secretary General of the Department of Health, TILDA Principal Investigator Prof. Rose Anne Kenny and Prof. Charles Normand, co-author of the report. The conference focused on how researchers and policy makers could work together to translate TILDA research evidence into policy action, addressing such topics as health screening in older adults, long-term care, the importance of early-life interventions and pension plans.